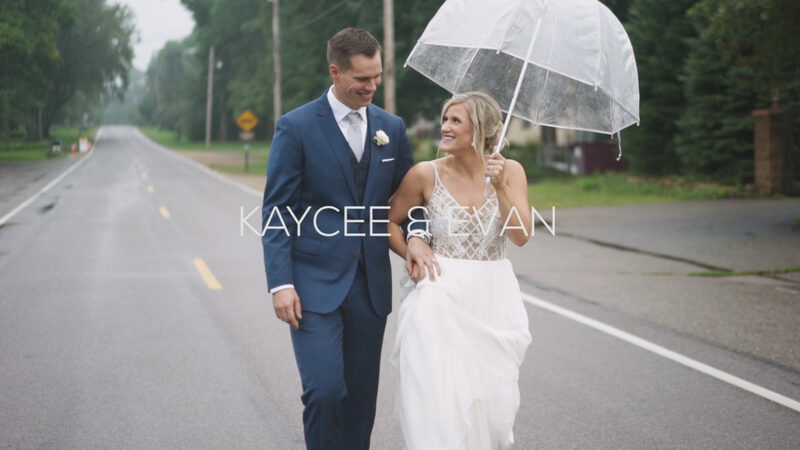 Sometimes rain is a really bummer on a wedding day, but with Kaycee and Evan we all got really lucky. They were able to see each other for the first time before it started to rain. Then it was drizzling but not downpouring for their pictures, and they were hopping in and out from under their umbrellas. Finally, it came down and the ceremony had to be held inside, but luckily the Historic John P Furber Farm had a great back up plan and Kaycee and Evan had decorated it so beautifully it looked fantastic! By the way, if you don’t know this wonderful couple, there is a moment in this film that may be confusing to you. At one point, everyone on the dance floor stopped dancing and started doing push-ups on the floor. To explain: Evan is actually a personal trainer and loves fitness. Some of the guests, including Kaycee, were past and present personal training clients and share their enthusiasm for health. So the push-up party was part work out, part homage to the thing that brought Kaycee and Evan together! Kaycee and Evan, we loved going through the wedding planning process with you, and we were so honored to capture your wedding day. Congratulations!